I grew up in a family of dessert eaters and this Lemon Meringue Pie was my Dad's favorite. It's a great tasting pie with that combination of a crust (you can choose either a pastry or a graham cracker crust), filled with a lemony cream filling, and finished off with a billowy sweet meringue. What I like too is that you don't need fancy ingredients to make this pie. Most ingredients you'll already have on hand. Things like butter, sugar, flour, eggs, and lemons. 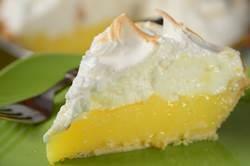 A Lemon Meringue is a single crusted pie. There are often debates on which is better, a pastry crust (used here) or a graham cracker crust. I will leave that up to you to decide. But for this recipe I'm using a pastry crust which does need to be prebaked (recipe and video here) because the lemon filling is made on the stove top and doesn't need to be baked in the oven. This pie has been around for almost two centuries and we may think of it as homey and old fashioned, but it can be quite challenging to make. Some may have trouble with the lemon filling being too firm (like jelly) or too soft and runny, but this can be easily fixed by adjusting the amount of cornstarch used. (As a side note the difference between a lemon filling and a lemon curd is that a lemon filling contains cornstarch (corn flour). Another difference is that a lemon filling contains water and this is to give the filling more volume.) But the real problem seems to be with the meringue topping. Some have the problem of the meringue shrinking or even slipping right off the top of the pie. (These two problems can be solved by spreading the meringue right to the edges of the pie crust and by placing the meringue on a warm, not cold, lemon filling.) But what seems to bother people the most is that dreaded "weeping" (beads of moisture) that can form once the pie has cooled. Some see it on the top of the meringue, while others find it forming between the meringue and the lemon filling. Weeping on the top of the pie can be caused by over whipping the meringue. Weeping between the meringue and the filling can be caused from undercooking the meringue. I find the best solution is to make a Swiss Meringue as I feel it's more stable. A Swiss Meringue is different than just whipping the egg whites and sugar in a bowl. Instead the egg whites and sugar are first heated over a saucepan of simmering water which dissolves the sugar and heats the egg whites until very warm. I do recommend using a candy thermometer to ensure the egg whites reach 160 degrees F (71 degrees C) which is the temperature needed to kill salmonella. Once that is done the egg whites are simply whipped to stiff peaks, placed on the warm filling, and then all you need to do is brown the meringue either under a hot broiler or with a propane hand torch. No baking of the pie is needed. I find it best to let the pie sit a couple of hours after it's made so the filling has time to become firm enough to cut. If you like your Meringue Pie to be slightly chilled then you can place it in the refrigerator, uncovered, for a couple of hours before serving. Lemon Filling: Place the egg yolks in a medium sized heatproof bowl and set aside. Then, in a heavy bottomed saucepan whisk the sugar with the salt and cornstarch. Gradually pour in the boiling water, whisking constantly. Place the saucepan over medium heat and, whisking or stirring constantly, bring just to a low boil. Adjust the heat and continue to cook the mixture for a minute or two or until thick and translucent. Remove from heat and whisk a little of the hot mixture into the egg yolks (to temper the yolks). Then whisk the egg yolks back into the hot mixture. Return the saucepan to the heat and cook, on medium low heat, stirring constantly, until the mixture just reaches a low boil. Adjust heat and cook for a few minutes (until you see large breaking bubbles) to cook the egg yolks. Remove from heat and whisk, or stir, in the butter, lemon zest, and lemon juice. If there are any lumps in your filling, strain. Then immediately cover with plastic wrap (to prevent a skin from forming) while you make the meringue. Meringue: In a heatproof bowl (preferably stainless steel) whisk the egg whites with the sugar and cream of tartar. Place over a saucepan of simmering water and, whisking or stirring constantly, heat the egg whites until the sugar has melted and the mixture is hot (160 degrees F or 71 degrees C) as this is the temperature that kills the risk of salmonella). Remove from heat and transfer the egg whites to your mixing bowl fitted with the whisk attachment (can use a hand mixer). Beat the whites on high speed until stiff peaks form. Beat in the vanilla extract. Finally, pour the warm lemon filling into your prebaked pie crust and smooth the top with the back of your spoon or an offset spatula. Then, using two spoons, place large spoonfuls of the meringue on top of the filling. Start at the outside edge of your pie making sure the meringue touches the crust. Gently press down on the meringue to remove any air bubbles. If desired, make swirls in the meringue with the back of your spoon. Then place the pie under a hot broiler (or you can use a hand held propane torch) until the meringue has browned. Watch carefully as it can burn very quickly. Let the pie rest at room temperature for an hour to two so the filling has time to set. Serve or you can place it, uncovered, in the refrigerator until serving time if you prefer a chilled pie. This pie is definitely at its best the day it's made. But leftovers can be covered loosely with a piece of foil and stored for a day or two.